Friday I did not post. I was very exhausted from CELTA. Last week we were given our 1st of 4 assignments. The topic is language analysis. We were required to breakdown a conversation and expose grammar form, meaning and pronunciation of words in those sentences. We had to discuss anticipated problems that our learners would encounter when understanding the meaning, pronunciation and form of words like “embarrassing” or “managed to” and we also had to discuss possible solutions. I spent Friday night working on those questions. Saturday I woke up early to move-in with my HOST family. 🙂 I thought I would be able to walk there no problem, since my luggage is on wheels. I grabbed both of my 50 pound suitcases, my backpack and began my trek. Right from the start, I began to encounter obstacles. I felt like I was part of a Nintendo game and each road became more challenging in order to advance to the next level. The sidewalks were cracked, uneven and the curbs were very high. The apartment is ADORABLE. Stephanie is my host. 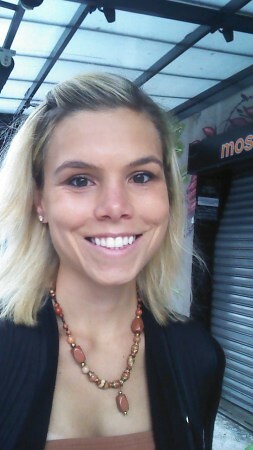 She is a super cute barista who works at a coffee shop nearby. She had to leave for work, but I will talk with her more later. I cleaned myself up and I was off to school. I met 6 other students to work on our assignment. I was able to finish the assignment, but it took about 5 hours. At 2pm, we all stopped to take lunch. I wanted authentic tacos. 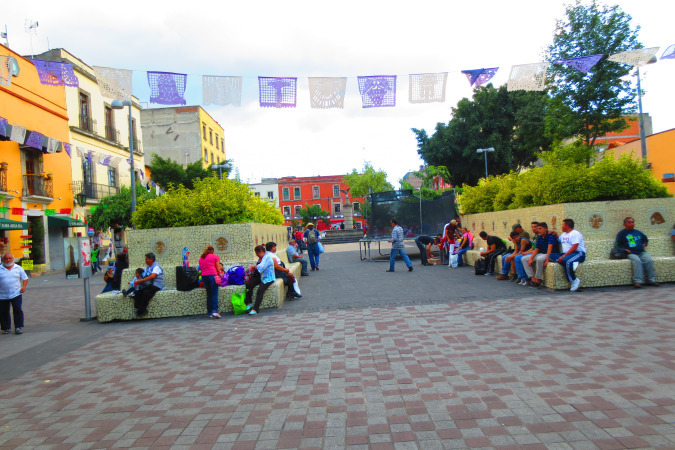 During the day, vendors set up their grills, tables and chairs along the street. The sidewalks literally transform into long restaurants covered by a large red tarp. I followed my nose to a stand selling blue corn tortilla tacos. 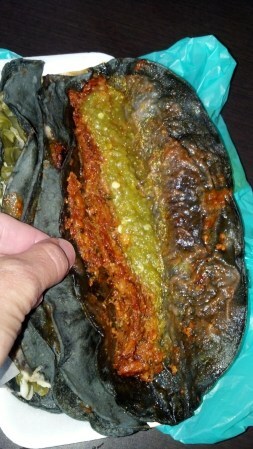 The taste is similar to a corn tortilla, yet made with a different variety of corn. I had 3 tacos. The first was beef barbacoa or slowly cooked beef. The second was pork and the third was nopales(cactus) and cheese. I tried the green and red salsa, which were both SPICY and DELICIOUS! After lunch and the assignment, I was able to relax and explore the city. 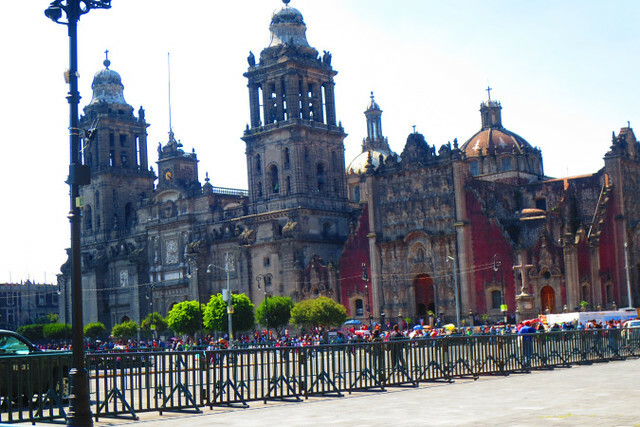 I took the METRO to the center of Mexico City. The metro lines are color-coded and easy to navigate. The metro costs less than 50 cents. 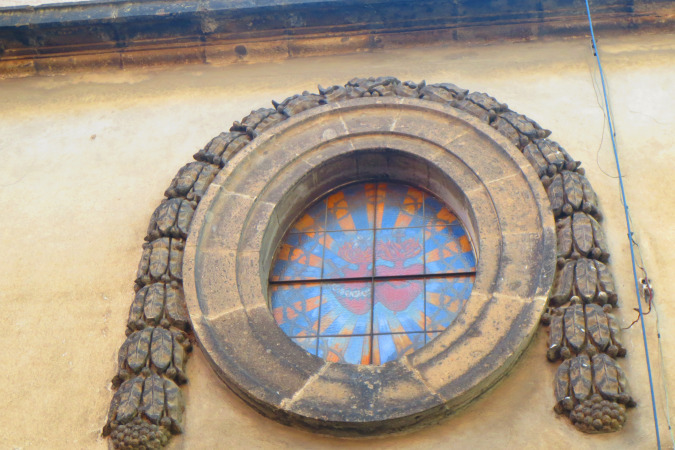 From the city center, I explored many historic churches and palaces. They were absolutely AMAZING. 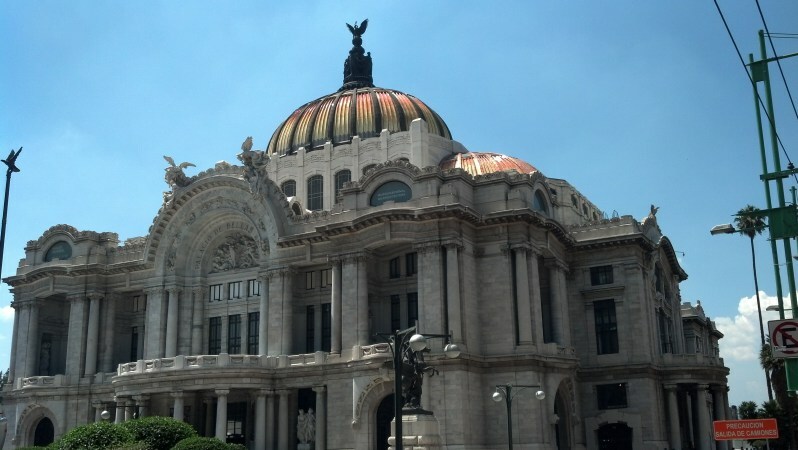 Here is the Palacio de Bellas Artes. Inside there is an art museum and it is also the venue for many theatre performances. Here is the Metropolitan Cathedral. 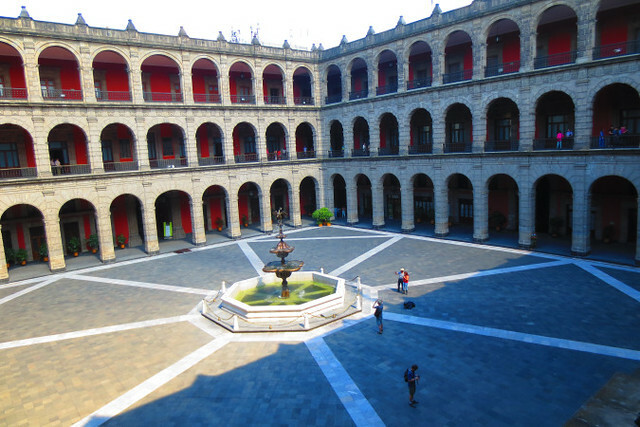 Here is the National Palace. 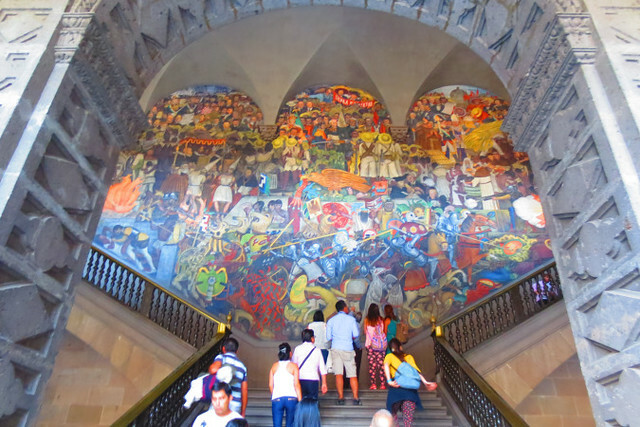 Inside the National Palace are beautiful works of art and the famous murals of Diego Rivera. Diego Rivera was a revolutionary artist whose pieces exposed the turbulent history of Mexico. 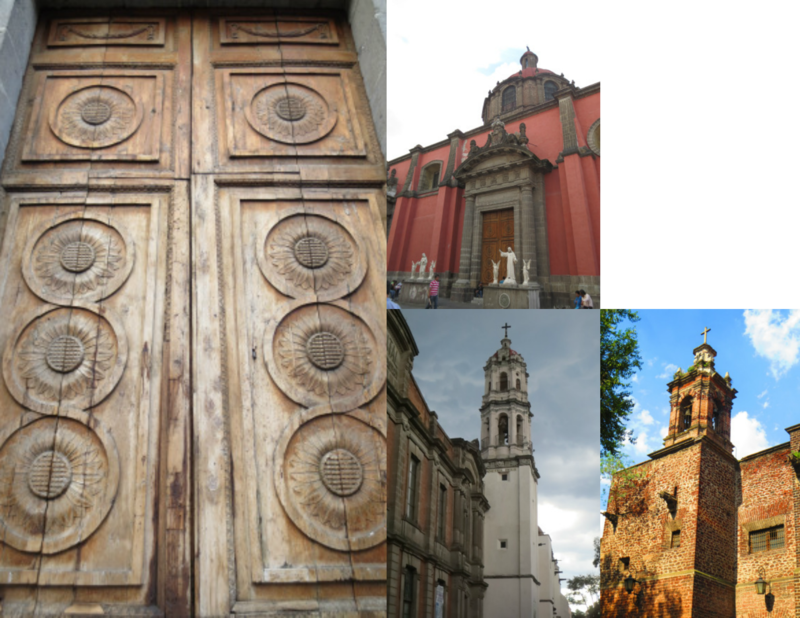 On the way home, I walked by so many gorgeous churches. 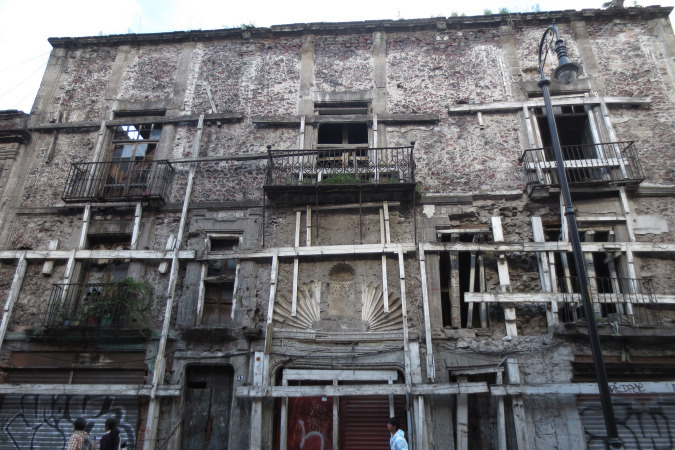 The architecture is stunning and there are hidden gems around every corner. 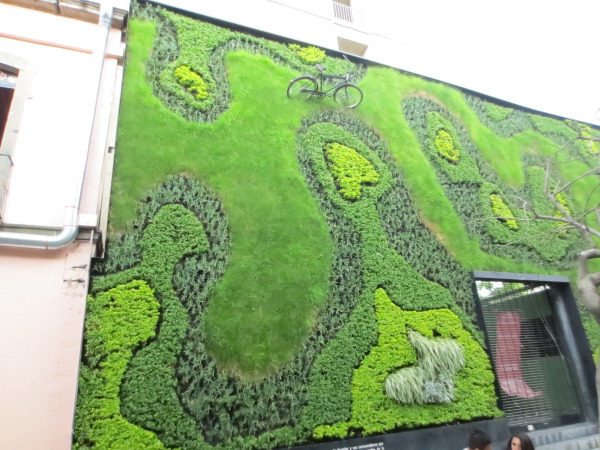 This vertical lawn is the wall of a restaurant. The last stop of the day was Pulqueria Insurgentes where I met up with classmates from school. We drank pulque, which is a fermented beverage made from agave. The flavors were wonderful. I sampled oatmeal, hibiscus, mango, pineapple and prickly pear. The pear was my favorite! 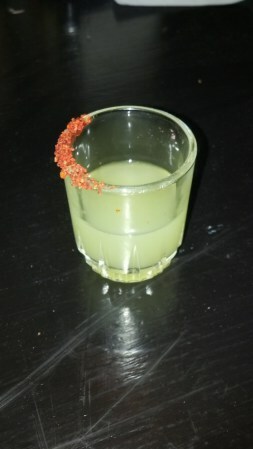 😀 The glass is lined with salted chili powder. So amazing! It is also quite potent. It was great chatting with students outside of class. Helen is from England and has moved here with her husband who is Mexican. They met when he was completing his Master’s degree in England. She also has an adorable baby girl. Becca is a clothes designer from Los Angeles. She is hoping to sell vintage dresses online for plus sized women. After a few drinks, I took a cab ride back to my new place. Overall, it was a fantastic day! Food isn’t like Sucasa is it? Happy that your enjoying your time there too. Poor Su Casa doesn’t even compare to the food here. I brought hand sanitizer, but I was not prepared for that! My host Stephanie told me that it was good luck. I guess everything has been going very well since then. Hah. I grabbed extra napkins to shove in my purse from now on. 🙂 Thanks for following the blog!